English Tudor with mantel shelf is another great choice fireplace. 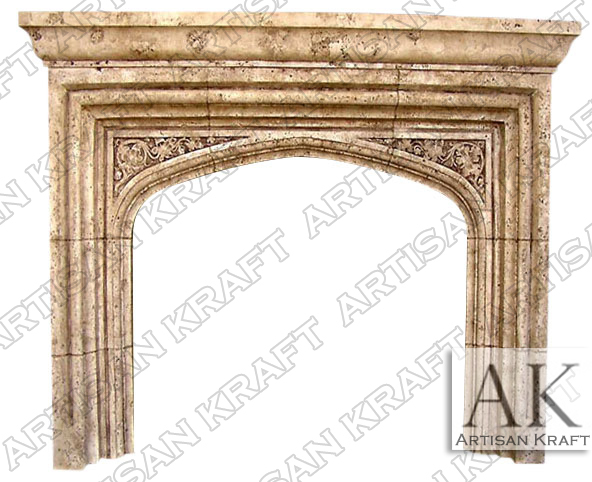 English Tudor with Mantel is one of our lager Gothic style surrounds. Here it is pictured made from cast stone. Our cast stone is a limestone bed man-made material. Making it from travertine gives it a very rustic look. If you are want for a restored historic or antique looking fireplace travertine would be a great material choice. This works great in a home or commercial setting. For less costly choices go with sandstone or travertine. These options also add to the rustic look. Install this in a cabin or your home office. Stone: Precast, limestone, sandstone, marble, travertine etc. Available in many different colors, textures and finishes.